I have some friends down in Texas that are true cowboys and one of their favorite topics involves discussing the use of cutting horses to cut or separate cattle out of the heard. This may be done for a variety of reasons but branding and separating the prize stock from the rest of the heard tops the list of conversations over a cold one at the local watering hole. With this in mind, we will take a pass at cutting out some of the best of the best in the realm of large venue projection and put as much distance as possible between us and the 1000 lumen 6 pound wonders you can buy at the local Office Depot or Staples. Before we get the saddles on the horses, we need to clear the air on a few issues regarding core display technologies used in large venue applications. Since I head up the new ISF Commercial effort and teach display technologies at InfoComm, I must remain display agnostic but this does not mean that the facts can be ignored. The bottom line is that in large venue, DLP rules by the shear magnitude of their efforts and overall industry acceptance. Try as they might, the superb looking D-ILA technology from JVC and the outstanding new SXRD products from Sony have not caught on in the rough and tumble world of rental and staging. In my humble opinion it all boils down to the fact that TI has developed not just a good technology but efficient programs to supply chips and modules worldwide that is the envy of every other supplier. Lest we forget the LCD camp, there are a lot of good looking 3 chip LCD projectors out there but on the large venue end from 5K lumens and beyond, companies like Sanyo and Panasonic seem to be among the few who choose to compete in this arena. In the final analysis it all boils down to the fact that DLP-based products are in the majority and each DLP based projector company must distinguish themselves beyond the core technology in physical design, lens options, lamp configurations, built in processors, and rigging solutions. 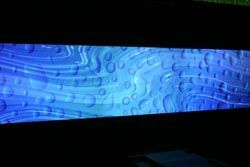 Since the core display engine is the same, the trick is to discover how well each manufacturer uses their proprietary supporting ingredients to differentiate their projectors to best meet your needs. As most of you know, I come from the big school of rental and staging projectors but the first cut out of the herd is the compact F3+ from projectiondesign. Parenthetically we might note that the parent company of projectiondesign based in Europe provides OEM projectors for other well-known brands in the industry not unlike the OEM efforts at Sanyo on the LCD side of things. The single chip DLP based F3+ weighs less than 30 pounds and it is a lightweight in terms of heft and physical dimensions but a heavy weight in terms of features, benefits, and performance. It comes in XGA and SXGA+ configurations and produces 6500 lumens with a 7500:1 contrast ratio. Okay, do not send e-mails on the contrast ratio but it does have really good contrast! It is a dual lamp design with variable power control that can get up to 8,000 hours of use. The F3+ has sealed optics for the dusty environments we all encounter and there are 6 lenses with internal lens shift to make your life easier. It incorporates many advanced features in the area of dual color wheels, DCDI processing, and all the inputs you could ever want. I have tested this projector and the images and build quality are first rate. Definitely a light weight but high performance projector to consider, and a reminder that there is and will continue to be pressure on the high end from upstart companies creating innovative products in smaller packages. Yes, this year mark's the 10th anniversary of the introduction of DLP technology, as acknowledged by Digital Projection International at their booth at InfoComm. Now back to the DLP herd. One of my favorite horses in the race comes from Digital Projection Inc. the original developers of DLP technology into the rental and staging market. Now I am going to extol the virtues of their new Titan 1080P projector but if you can only remember one point, think about the best picture quality on screen comparing favorably with the best of digital cinema and you will have the core reason to look at the Titan. It features the (now) ubiquitous 1080P Three-Chip DLP engine in a nicely sealed package but it has a proprietary Xenon Color Mode and P-7 colorimetry which accurately replicates the color space and D6500 white point of Xenon lamps. In our evaluation it delivered broad color gamut for realism you need to see to appreciate. It is a dual lamp design for redundancy and has variable power to closely adapt to each environment. It produces up to 6000 ANSI Lumens and 2000:1 contrast. DPI offers excellent quality lens options with throw ratios from .87:1 up to 6.4:1 for most applications. The lens system features motorized horizontal and vertical lens shift, with extended shift-range beyond the screen dimensions giving you the option to install the TITAN in locations where no other projector can work. Of course it has a plethora of inputs and the coolest optional rigging frame on the market but aside from the neat features and the excellent 1080P DLP engine, it is all about the image on screen. Good job DPI. And just as we went to press with this issue, Digital Projection International introduced its latest 3-chip DLP Professional Series projectors, the HIGHlite 10000Dsx+ and HIGHlite 16000Dsx+. The new 1400x1050 resolution projectors offer increased brightness from previous models, due to optical system enhancements and a higher efficiency 2-Kilowatt xenon lamp. The HIGHlite 10000Dsx+ delivers 9,500 ANSI lumens at 2000:1 contrast, while the 16000Dsx+ produces 13,000 ANSI lumens at 1800:1 contrast. Equipped with liquid cooling for the quiet operation, the HIGHlite Pro projectors can be installed in noise sensitive environments, and the units can be customized to include advanced options such as seamless cross-fade and user-definable geometric warp. Active stereo display (3D) at resolutions up to 1400 x 1050 at 96 Hz is also supported. The HIGHlite 10000Dsx+ and HIGHlite 16000Dsx+ will begin shipping, according to DPI, in November 2006. We would of course be remiss if we did not mention one of the best products coming out of Christie Digital. My pick is their outstanding Roadster HD12K. First of all, my hat goes off to Christie for naming their products better than anyone else. Having worked decades ago as a roadie, I love the Roadster name. Also, having worked at my long lamented Hughes-JVC, I love the 12K reference, so they start out fine in my book. Once again we see the true HD native resolution at 1920 x 1080 with the sealed and protected 3 chip DLP engine. What separates the Roadster 12K from the herd is 12,000 lumens with variable contrast ratios from 1500 to 2000:1 and true 10 bit signal processing power. This gives the rental and staging company the ability to provide enhanced image detail with blacker blacks and whiter whites in a variety of environments and from a number of different sources. Speaking of sources, Christie provides 2 High Definition input channels that allow 4:4:4 HD signals. This model also features standard built-in edge-blending, digital dark level adjustment, and what they call their Intelligent Lens System on zoom and focus, plus DMX 512 communication capabilities. To wrap it up, they use a cool technology they refer to as a Xenon Bubble lamp system providing repeatability of photo-realistic colors and the ability to accurately color-match images. There are a number of projectors in the Christie HD family but this one is a fine example of the breed. We have left the Barco big gun (or is that a big cannon?) for the last slot in our large venue dream list. How about 30,000 lumens and 2048x1080 native resolution to keep you warm at night? Just so you do not think the XLM HD30 is all about power, lets throw in 16 bit color processing to help with detailed edge blending and the ability to view 4 input signals simultaneously for multi imaging. Barco has included a really neat 6.3KW quick change lamp module with 3, yes 3 power supplies for redundancy. Of course they have built in rigging and even a motorized tilt to help move that 400 pound load when you are the only setup tech around. They even provide a ruggedized remote control as a bonus for buying big. Now for those of you who are put off by size and pure horsepower, check out the new FLM-HD 14 and 18 series. These are great projectors with superb performance. The FLM HD18 and FLM HD14 answer the need for high brightness native HD projection in large venues, whereas the XLM HD30 is ideally suited for projecting HD images in ultra-wide-screen applications. The FLM HD18 delivers native HD (1920 x 1080) at 18,000 center lumens brightness output in a compact and lightweight chassis. The FLM HD18 boosts fully sealed optics and impressive lamp maintenance ensuring an overall lower cost of ownership. The FLM HD14 with its 14,000 center lumens brightness output, is optimized for wide screen applications which demand, not only high brightness, but also extremely low noise and an ultra long lamp lifetime. The lens range (TLD HB), of the Barco RLM and SLM projector series, can be re-used on the FLM series. Thanks to this feature, investment in new lenses is not necessarily compulsory. Furthermore, both the FLM HD18 and FLM HD14 have exceptional video performance thanks to advanced 10 bit processing. Their exceptional brightness, compactness and near silent operation make them the perfect solution for a wide variety of applications where quality and high brightness cannot be compromised. DP, Barco, and Christie are not the only game in DLP large-venue .Others are entering, albeit none in the very high brightness category. Panasonic has recently entered the race with a 10,000 lumen model. The new large venue PT-D10000 and PT-DW10000, which build upon the current Panasonic D7000 series projectors, were introduced at InfoComm. The PT-D10000 includes brightness of 10,000 lumens, S-XGA+ resolution (1400x1050), 4,000:1 contrast ratio, standard DVI input with HDCP, and DLP 10-bit video processing. It follows in the footsteps of the D7000 series giving customers the benefit of improved light output and image processing, and the ability to make use of the same lenses and optical input modules as the D7000 series. It offers high contrast ratios by applying Panasonics dynamic iris. The PT-DW10000 is a full HD resolution (1920x1080) version. Before closing, a couple of other trends should be mentioned. The first one is the migration to 1080P HD resolution. It seems that every display company is jumping on this bandwagon to help differentiate themselves. If they scream at the top of their lungs about 1080P loud enough and long enough it may just become a self-fulfilling prophecy and your clients may demand it. My admonition is to look closely at 1280 x 720 and 1400x1050 units, and compare the pictures versus the cost differential at least in the early days of the rush to compete at the high end. The second trend is one that companies like DPI and Christie are embracing and that is to develop a whole lineup of ruggedly built projectors from 2500 lumen compact models all the way up to the 25K power house. These guys have a clear focus on what their customers have come to expect. This is a change from just a few years ago when projector manufacturers tended to concentrate on one class of products, and there was, for example, a shortage of good projectors in the mid-range. There you have the roundup and the products that we cut out of the herd that caught our fancy. The large venue products that we see today are investments in the future and with high resolution chips, near-digital cinema performance, and rugged designs, this is good for business, good for your customers, and good for the bottom line.